Villa Jag is idential to Casa Cathy (but handed) also set on a 500m2 corner plot, ultra-modern in design, close to the beach and has lovely views of the mountains. 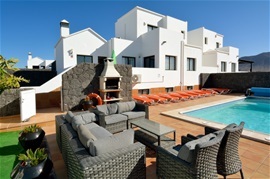 The villa has its own south facing garden which has a huge terrace and a large private swimming pool, perfect for non swimmers and children as the pool also has a shallow end with steps leading into it. In the corner of the garden is a large Jacuzzi which has seating for 6 adults. Also in the garden is a Mediterranean brick BBQ, perfect for those summer barbecues. The lower Patio Garden is surrounded by Canary Islands black volcanic rock wall and has steps leading up to the pool terrace. Relax in this garden with a nice glass of gin and tonic or have a game of pool. Have lunch on the kitchen terrace, which has a table and seating for 10 people. Villa Jag has a large beautifully furnished living/dining room on the first floor which has dual aspect windows and a patio door that leads out onto a sunny terrace area. A 5 minute drive away is Playa Dorada beach or a 20/25 min walk - follow the path which is decoratively covered in beautifully richly coloured bougainvillea.